A very, very long day at the hospital. We set of at 7.30 and only just arrived home at 6.30. Our first appointment with the Ophthalmologist, although scheduled for 9am didn’t happen until 11.30am. When you don’t know the language and end up delayed you end up convinced that you’re in the wrong place, have misunderstood and have been waiting for ages in vain. You’re a completely incompetent foreigner who had caused your two little boys to hang out in a hospital all day and will have to do it again to get another appointment. In reality…you are in the right place and just need to be patient (ironically) and wait. In Portugal things take time. Things take time because sometimes they try and squeeze you in so that you can all be seen on the same day, save you having to make the one hour drive again. Being considerate sometimes means that you have to be patient. When we did finally see the Ophthalmologist Mayhem had to wear an eye patch and watch what I can only describe as a puppet show of wavy lines. I was dying to laugh as the overly cheerful eye doctor presented a series of cards with a hole in and wavy lines whilst whispering encouraging words in Portuguese to Mayhem, who was completely freaked out, sobbing and ready to go over the edge to screamsville any second. He held it together and it was over quickly, thank goodness. Then for the drops, quick trip to the cafe for 10 minute wait then back for another set of drops to make him blink less for the eye exam. Another few sobs and a bit of a freak out at the bright light being waved in his face and it was over and done with. No abnormalities, normal optic nerve, normal eye but (in my experience of having a sick child there is always a but), BUT, he is too young to develop lisch nodules, so too young to be able to tell if he has NF1. The Geneticist confirmed that we are just going to have to wait and see, have another eye examination in a years time and take it from there. As they don’t do genetic testing for NF1 in Portugal. So it has to be a case of no news is good news. After a very tired boy had blood tests to rule out any other genetic conditions linked to teratomas he fell asleep in the carrier with a little help from his beloved ‘boo boo’. It really is awful to see him experience pain. With his tumour he was only ten months only and he just wasn’t as aware but now, it seems like he feels the pain more and is scared. Poor guy. The Oncologist was happy that he was doing really well, asked for more bloods (uh-ho) to check his tumour marker levels and sent us off for an hours break. After another couple of hours to see the Cardiologist we finally got the best of news about Mayhem’s heart. As the teratoma was so invasive, it was attached through his pericardium, and onto the aorta. As it was so large it actually compressed the heart so much that it changed it’s size and shape, the right side of his heart was much smaller than it should be, gradually and very slowly the heart has repaired itself and today we got the fantastic news that his heart is back to normal. Normal, what a wonderful word to hear. Normal function and normal size. Fan-Blooming-tastic! How amazing the body is to create such evil as tumours but to then have the ability to fix the heart. This is probably going to be our last trip to Coimbra as we are due to move on to pastures new next month as our housesit finishes. Despite all the warnings about the atrocious healthcare system in Portugal we have nothing but praise for the world renown Coimbra University Hospital. If you are considering move, however temporary to this area, please rest assured that this hospital is one of the best for Paediatrics. Although we didn’t get any definitive answers today, we didn’t get any bad news and instead got some fantastic news. Definitely an awesome day. 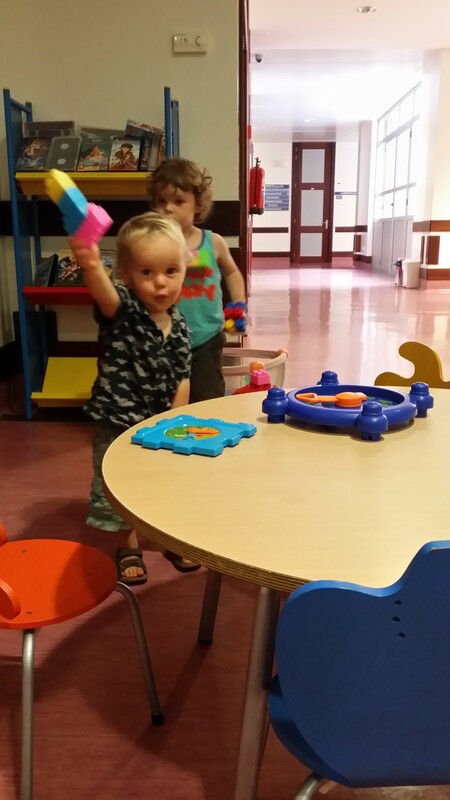 Oh, and although as adults we hated the waiting, blood tests and examinations excluded, the boys had so much fun playing with the toys and other kids. For them it was mostly a great day out!